Malala Yousafzai’s inspiring story is well documented and there have been many books about her already. 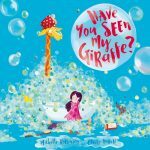 This newest picturebook however is written by Malala herself and reaches to a younger audience with a message of resilience and hope, telling her story in a way that is wonderfully engaging and pitched perfectly. The black and white unillustrated page which replaces the scene of the shooting, rather than show or mention it directly, is a superb example of encouraging inference and dialogue between child and adult reader. Kerascoët’s artwork, using soft watercolours, is a perfect match. 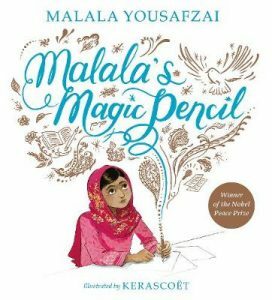 I love how the texture of the paper comes through the drawings, and the inclusion of gold to convey Malala’s dreams, speeches and writing wonderfully expresses just how special a person Malala is. I love this book! The first thing that strikes you as you discover this large format book is how vivid Lorna Scobie’s art is, with bright colours and beautifully detailed and morphologically accurate yet with a lovely humorous touch (it must be those googly eyes). The design of the book is also stunning; I love the headings on the side particularly, which include facts as well. The design is clear, attractive and the pages never crowded. And if all this isn’t enough to sell it to you, it is also written by Nicola Davies, who is the Queen of natural world writing for children. She has such as talent for pitching books perfectly, explaining scientific facts in a accessible and fun way. 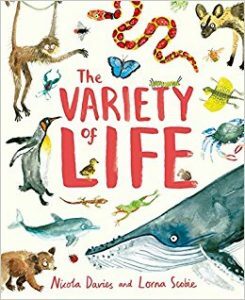 This text, which focuses on the diversity of the natural world, is a great example of that. A stunning book! 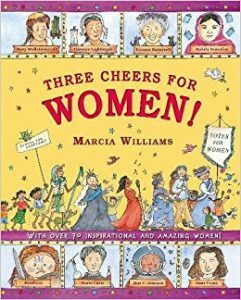 Over 70 inspirational women from across history and from all walks of life are celebrated in this wonderful new book by Library Mice favourite Marcia Williams. Her hybrid style is unique: she mixes comic conventions such as sequential strips and speech bubbles and narrative text to create her signature form of narrative non-fiction. Lots of details both in the text and the illustrations, give readers much to read and look at, including facts, jokes and quotes. While 16 women have a double-spread devoted to their lives and achievements, 3 other double-spreads showcase other inspirational women using illustrated vignettes. This is a hugely eclectic selection, powerfully highlighting the contributions women have made across the world. This large format book introduces readers to 23 masterpieces from museums around the world. Each oversize double-spread is dedicated to a painting, from papyrus to Pollock, with the reader also presented with several close-up details of the painting to look for, encouraging them to look more closely at each piece. 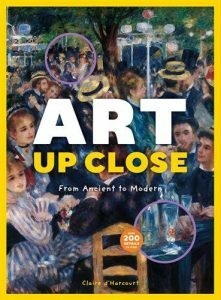 At the end of the book, readers will find a explanatory paragraph about each painting, as well as lift-the-flap mini paintings giving the location of the close-ups and mini artist biographies. This is such a ludic way to train the eye not only to look for meaningful details in art (a facial expression, the placement of objects or animals) but also encourage a more developed appreciation of art in general, which is facilitated by the oversize format. A great book! 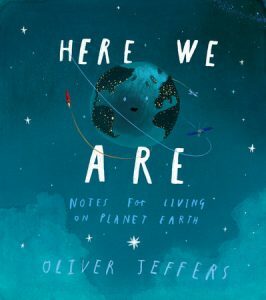 A beautifully lyrical, heartfelt yet witty and cheekily wry book like only Oliver Jeffers can make them, Here We Are is written as a letter to his then newborn son, attempting to help him make sense of the world and what it is like to live on Earth. Each double-spread is dedicated to a different theme, might it be the universe, animals and people, the sea, the body or the passing of time, all conveyed in Jeffers’ trademark and much-loved style. I loved the more unusual colours he has used for this project, and particularly the stunning purple hues. 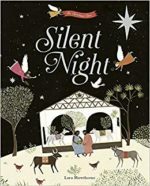 Full of tenderness, hope and compassion and a real plea for tolerance and kindness towards our planet and all of its inhabitants, it is a stunning, emotive picturebook which will make a perfect gift for families welcoming new arrivals.